Precarious situation: The collapsed beams along Jalan Tun Sardon which fell and broke after being knocked down. 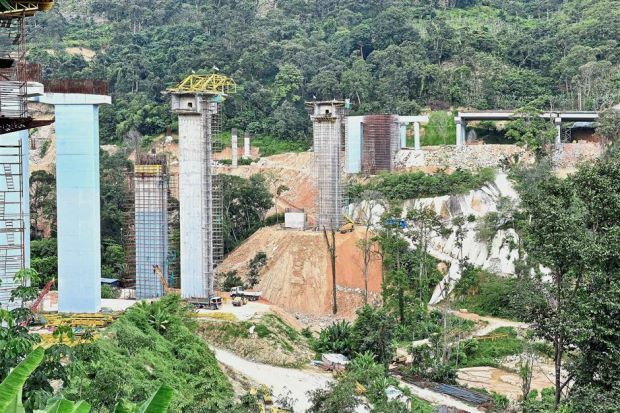 BALIK PULAU: The contractor of the 600m elevated road project linking Jalan Bukit Kukus to Jalan Tun Sardon here has been issued with a stop-work order. The order came following a mishap on the site where 14 concrete beams measuring 25m each fell onto a slope in Jalan Tun Sardon on Thursday. Eleven beams broke apart in the 8.30pm incident. However, no injuries were reported. It is learnt that a crane operator accidentally knocked down one of the beams laid on the ground, causing others to fall onto the slope like dominoes. Penang Department of Occupa­tional Safety and Health (DOSH) director Mohd Rosdee Yaacob said the contractor had been instructed to be present at the DOSH office tomorrow for a meeting. “We are reviewing the standard operating procedures at the work site. Mohd Rosdee said his officers were only sent to the site on Friday as they were not immediately informed of the incident. State Works Committee chairman Zairil Khir Johari said the contractor had been told to prepare a full report for DOSH. He said the Penang Island City Council (MBPP) would also initiate an internal inquiry tomorrow. The construction of the elevated road, together with the upgrading of a 1.1km stretch along Lebuhraya Thean Teik and a 1.5km stretch along Lebuh Bukit Jambul, is a MBPP project costing RM275.6mil and is scheduled for completion early next year. The three segments are part of the project for the construction of the RM545mil alternative road – Jalan Bukit Kukus – to help ease traffic snarls along Jalan Paya Terubong, which is an arterial road linking Bayan Baru, Balik Pulau and Air Itam. Slow path ahead: The elevated road near Jalan Paya Terubong in Penang will not be ready for another two years. GEORGE TOWN: Work on the RM545mil Jalan Bukit Kukus paired road project has hit a snag even before the construction mishap in Jalan Tun Sardon. 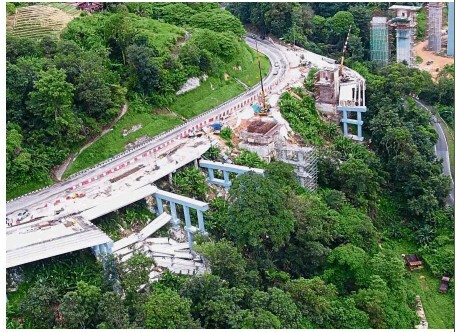 The completion date on the project, an alternative road linking Lebuhraya Thean Teik in Bandar Baru Air Itam to Lebuh Bukit Jambul, will be delayed by a year till mid-2020 due to unforeseen obstacles during construction. State Works, Utilities and Flood Mitigation committee chairman Zairil Khir Johari, in describing the project as “very complicated”, said it was constructed by three parties as a cost-saving measure. “The Penang Island City Council (MBPP) will construct 2.8km of the stretch, while PLB Land Sdn Bhd and Geo Valley Sdn Bhd will construct the remaining 1.4km and 0.7km respectively,” he said. Zairil said while the three parties involved in the works faced various issues resulting in the delay. “For example, the MBPP which is working on the 2.8km stretch costing RM275.6mil, faced a delay due to land acquisition issues, realignment and relocation of cables. “The project is 69% done and to be completed by early 2020. “PLB Land faced issues with big rocks and boulders. The RM150mil section has progressed 36% and scheduled for mid-2020,” he said. Zairil said that Geo Valley faced legal issues as the residents affected by their section of the project took up matters with the Appeals Board and the case was pending. The RM120mil stretch by Geo Valley is now 18% completed. “Once PLB and Geo Valley complete their portions, we will connect them accordingly,” he said. It was earlier reported that the contractor of the 600m elevated road project linking Jalan Bukit Kukus to Jalan Tun Sardon was issued with a stop-work order. The order came after a mishap on the site where 14 concrete beams measuring 25m fell onto a slope in Jalan Tun Sardon on Thursday. No injuries were reported. It is learnt that a crane operator accidentally knocked down one of the beams laid on the ground, causing others to fall onto the slope. Paya Terubong assemblyman Yeoh Soon Hin hopes that there will be no further delays. “About 60,000 vehicles use Jalan Paya Terubong daily to get to Bayan Lepas, and traffic congestion is bad during peak hours. “I hope the project will be completed safely according to specifications and on schedule for the people to use,” he said. Once the alternative route is completed, traffic is expected to see a reduction of at least 30%. The new link will comprise a dual carriageway with a bicycle lane, walkway and LED street lights. A small waterfall on the hill will also be retained and construction would go around the waterfall.